N Scale layout built on a 36” x 80” hollow core door with folding table legs. DC (direct current) power pack included. Layout easily converted to DCC (Digital Command Control), DCC controller not included. Track plan is based on the Carolina Central published in the December 1997 and January 1998 issues of Model Railroader magazine. Two mainline tracks – total approximately 28’. Minimum radius 13”. Eleven structures included. Train not included. Founded in 1973, the purpose of the Carolina Model Railroaders is to promote model railroading, build and operate model railroad layouts, and to foster fellowship among persons interested in model railroading. Membership in the Carolina Model Railroaders is open to any person interested in the goals of the organization. 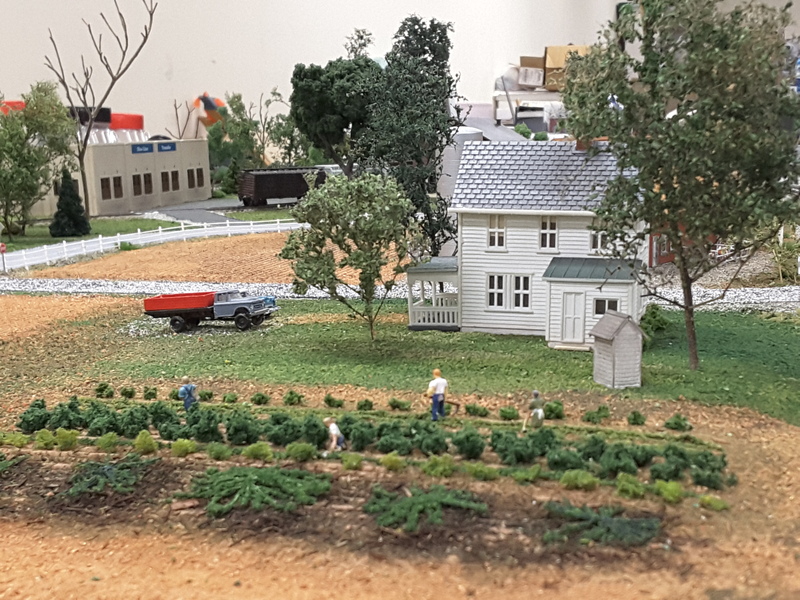 We are currently building an HO Scale (1:87) layout featuring Greensboro, focusing on the area between the Spring Garden Road roundhouse and the Depot. During this first phase, we plan on have several identifiable historic buildings represented on our layout. Our club models in two primary scales, N and HO. However, we built and maintained the O-gauge layout at the Greensboro Children’s Museum that was displayed for about 9 years. We also operate a Z-scale layout at shows and special occasions. Our club is open to all who wish to promote and further model railroading. Family participation is encouraged and visitors are always welcome. From the "glory days" of steam locomotion to today's fast-paced world of high-speed urban transports, railroading has played a key role in developing our vast American landscape. The Greensboro Chapter of the National Railway Historical Society works to preserve this heritage by bringing together a core group of individuals dedicated to reliving the past glories and future possibilities of the world's most exciting form of transportation. Founded in 1977, the Greensboro Chapter is but one of over 160 chapters located throughout the U.S. and Canada. Activities include monthly meetings, a library, trips to places of railroad interest, and railroad excursions on some of the Piedmont's most exciting railway systems. We also enjoy railroad literature, music, poetry, and meeting railroad people. Family participation is encouraged and visitors are always welcome. The NRHS is a non-profit section 501(c)(3) organization, and contributions are tax-deductible.